This book consists of papers presented at an international symposium spon- sored and organised by The Rank Prize Funds and held at The Royal Society, London, on 27-29 September, 1982. Since the inception of the Funds, the Trustees and their Scientific Advi- sory Committee on Opto-e1ectronics have considered that the scope of opto- electronics should extend to cover the question of how the eye transduces and processes optical information. The Funds have aimed to organise symposia on topics which, because of their interdisciplinary nature, were not well cov- ered by other regular international scientific meetings. 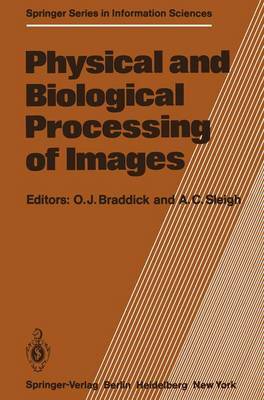 It was therefore very appropriate that the 1982 symposium should be on Physical and Biologi- cal Processing of Images. The purpose of the symposium was to bring together scientists working on the physiology and psychology of visual perception with those developing ma- chine systems for image processing and understanding. The papers were planned in such a way as to emphasise questions of how image-analysing systems can be organised, as well as the principles underlying them, rather than the detailed biophysics and structure of sensory systems or the specific design of hardware devices. As far as possible, related topics in biological and artificial sys- tems were considered side by side.